The Olympic Games are highly commercialised. They purport to follow the traditions of an ancient athletics competition, but today it is the commercial aspect that is most apparent. I have seen how, through sport, cities and corporations compete against each other for financial gain. The Olympics are beholden to the wishes of various commercial operations, which in turn shape our understanding of the event and of the world. They are no longer connected to the idea that humanity can be expressed through athletics. In China, the Olympics have always served as a tool for propaganda. China uses its gold-medal count to affirm its position in the world order and its strength as a nation. Many other countries have the same attitude. But flaunting gold medals, in the guise of fighting for a country’s glory, is done at the expense of many lives. For one, athletes sacrifice their physical and emotional wellbeing for this vanity. This is a tragedy in itself. I don’t believe in the so-called Olympic spirit. I speak from personal experience. When China hosted the Games, it failed to include the people. The event was constructed without regard for their joy. The state and the Olympic committee failed to take a position on many major social and political issues. 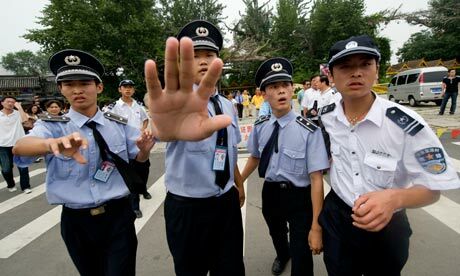 Afterwards, the state tightened its controls; China became a police state. “Friendship, fair play, glory, honour and peace”: the Olympic slogan is an empty one. My memory of the Beijing Olympics has not changed. It is a fake smile, an elaborate costume party with the sole intention of glorifying the country. From the opening to the closing ceremony, from the torch relayto the cheers for gold medals – these all displayed the might, and the desperation, of a totalitarian regime. Through authoritarian power a country can possess many things, but it cannot bring joy or happiness to its people. I see the Beijing National Stadium as an architectural project. I acceptedHerzog and De Meuron‘s invitation to collaborate on the design, and our proposal won the competition. From beginning to end, I stayed with the project. I am committed to fostering relationships between a city and its architecture. I am also keen on encouraging participation and exchange during mass events that are meaningful for humankind. I have no regrets about the role I played; the stadium is a work of great quality and design. I only withdrew from participating in fake performances laden with propaganda. I disagreed with the approach, and did not want my name associated with it. The Beijing opening ceremony had no sensitivity for the Chinese people; it even had the police force dancing on the fields. This is the fantasy of a totalitarian society. It was a nightmare.